I’m excited to bring a little more insight on my 12th-ranked prospect in the Miami Marlins organization according to my recently published 2018 Marlins Top 50 Prospects. 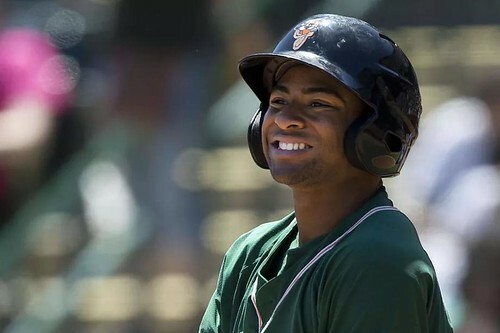 I thought it would be a great time to feature the Marlins 2017 Minor League Player of the Year and was lucky to get a short phone interview with James Nelson. Just to familiarize you with some of his 2017 statistics, Nelson hit 7 HR, 31 doubles and 3 triples to go along with a .456 slugging percentage. His strikeout rate was a respectable 27%, hitting for average at .309 and his OBP was .354. Nelson stole 6 bases which is one less than he had in 2016 but his stolen base percentage went up a few ticks due to being caught one less time. Here are some of the questions I posed to Nelson, followed up by some great responses. SC: Your favorite team growing up? To my surprise it was not his uncle’s team, the Colorado Rockies, but the ever-popular New York Yankees. SC: Your favorite player growing up? JN: Derek Jeter, but no, I haven’t yet had the opportunity to meet Captain Clutch. SC: Do you think you play like any particular player or who do you strive to play like? JN: I’ve been influenced by Jeter and Adrian Beltre but the main contributors to how I play today is my family. I do believe that all baseball players are superstitious in some respect, which prompted my next question. SC: Do you have any superstitions when it comes to the game of baseball? JN: If you want to call it that it’s small but if I eat something for breakfast and have a bad game it will be a long time before I eat that again! SC: You can only do so much baseball in a day. How do you like to relax and decompress? JN: Through video games. The game I played most growing up was Call of Duty but recently I’ve become addicted to Fortnite. We shifted gears and started talking baseball. SC: What it was like coming into pro ball as a 15th round pick from a small school? JN: It was just different. The grind is different in professional ball. You wake up early, get to practice and then play the game. SC: What is one of his biggest challenges you’ve experienced going from the Gulf Coast League (rookie) to the South Atlantic League (A-Full)? JN: The number of fans in attendance at the games. The Gulf Coast League would have maybe a dozen fans and then going to the South Atlantic League there would be approximately 5,000. I just had to focus and drown out the noise to be successful. SC: What’s been your favorite thing about your time in the South Atlantic League? 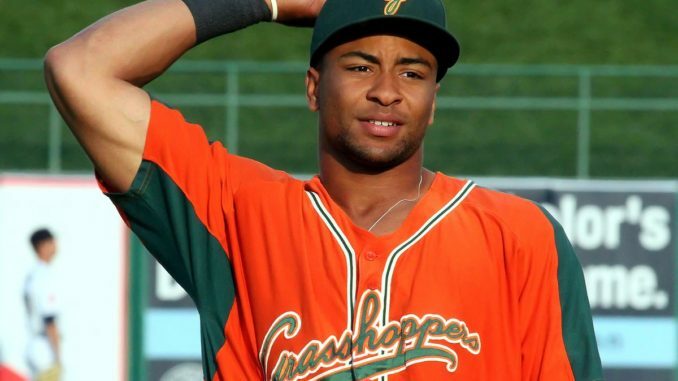 JN: All the walk off wins the Greensboro Grasshoppers had last year and all the fans screaming and cheering for us. SC: We’ve heard all about the tortures of travel for a minor leaguer, especially at the A-ball level. How has that experience been for you? JN: I was fortunate to be on the Greensboro Grasshoppers and they’re in a good position for travel right in the middle of everywhere they need to be in the Sally League. SC: What did it mean to win the 2017 Marlins Minor League Player of the Year award? JN: It means a lot to me and it was great just to get noticed. An incredibly humble answer in my book. SC: As for right now, what did you go into this offseason looking to improve? JN: I’m looking to get stronger and faster and want to work on my defense. This offseason has been successful in that regard. Nelson told me he has bulked up to 200 lbs. and sustained that weight. He’s been practicing his craft all offseason and hopes that his defense will be much improved over the 19 errors he had in 2017. SC: When you face a big-time arm, as a hitter, what is the key to putting together a good at bat? JN: You must be on time. That is the key, and when you are on time, make sure you are swinging at good pitches. During the game making slight adjustments is key. Sometimes against right handed pitchers their arm slots are behind you, so opening your stance helps. I haven’t changed my approach at the plate since turning pro and that’s a good thing because what I’ve been doing has been working. SC: Any tricks of the trade that help slow the game down for you? SC: What goals have you set for yourself going into 2018, your third professional season? JN: To hit the ball harder, steal more bases, and make plays on defense. I think if he accomplishes all his goals, Nelson can rocket himself up into the discussion as top prospect in the organization. As for now he will report to minor league prospect camp February 5th. He does not know where he will be starting the year but it’s only a matter of time before he’s in Jacksonville playing for the Double-A Jumbo Shrimp knocking on the doors down in Miami. Special thanks to James Nelson for taking the time to talk to me. Everyone should follow him on Twitter at @WoahitsNelly.